The prospect of execution of two Australians in Indonesia has caught international media attention, amid Australian protest. But these are part of a wider official spasm, in a country dominated by a ‘tough on crime’ narrative. 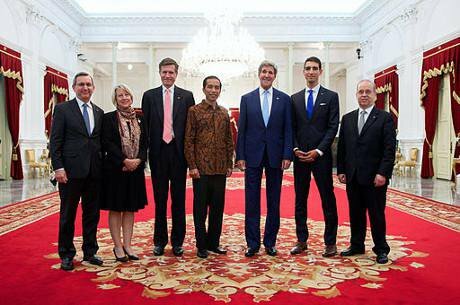 Not so fast: the US sent a high-level delegation, led by the secretary of state, John Kerry, to the inauguration of President Widodo (centre) in October in Jakarta. Wikimedia / US State Department. It had seemed Indonesia was moving away from resort to the death penalty: it ended a five-year pause in the use of death penalty in 2013. Yet after little over four months in office, the president, Joko Widodo, has overseen the executions of six prisoners, with a further 11 planned in the coming month. The executions, all for drug-related offences, involve foreign nationals, including from Australia, Brazil, Nigeria, Spain, the Netherlands and Vietnam. And there has been strong external condemnation: Brazil and the Netherlands have recalled their ambassadors, while Australia is imploring Widodo to stay the executions of Andrew Chan and Myuran Sukumaran, due in the days ahead. As Diane Zhang has pointed out, just two months into 2015 more executions are set to take place in the country than in any previous year—indeed if the 11 go ahead as planned, as many on a single day as any prior annual toll in democratic Indonesia. The resumed use of the death penalty is shocking. The practice is increasingly deemed unacceptable internationally, with a record 114 countries now supporting a moratorium. There is, more than ever, a shared sense that this is an unjust penalty incompatible with the human-rights standards the international community expects states to uphold. It is also surprising: Widodo was mostly seen as a progressive reformer, with his trademark peace sign and promise to address government corruption following his election. The justice system is one area where corruption remains a prominent issue. Police powers and brutality have been common complaints among Indonesians and the decision by Parliament in January to appoint as national police chief an officer being investigated by the Corruption Eradication Committee led to public protests—the president has overruled the appointment. Tied humanitarian assistance is, of course, a very outdated approach to aid. Widodo however endorses Indonesia’s established ‘tough on crime’ stance, citing the devastating effects of drugs in particular. Yet this can facilitate the very corruption, lack of professionalism and inefficiencies the president seeks to curb. ‘Tough on crime’ approaches empower the police and others within the criminal justice system, while weakening the position of suspects. In Indonesia they have been demonstrated to provide cover for harsh policing tactics, high levels of arrest, excessive pre-trial detention, weak presumption of innocence and heavy sentencing. They thus do little to curb corruption and abuse of power and support justice. And while it might seem logical to assume that being ‘tough on crime’ makes for a safer society, evidence suggests the opposite. Yet the way the issue of the death penalty in Indonesia has been dealt with internationally has not always been helpful. The mounting pressure from Australia has highlighted important points—the capacity of offenders to reform and make valuable contributions to society, as well as the Indonesian government’s own efforts to secure clemency for its citizens facing the death penalty overseas. But there have also been bungled efforts. The Australian prime minister, Tony Abbott, said he felt “let down” that Indonesia could execute two Australian nationals, given the AUD 1 billion of assistance his country had provided following the 2004 Boxing Day tsunami. The veiled threat has understandably not gone down well in Indonesia—prompting a ‘coins for Abbott’ campaign, with Indonesians donating money to give back to the Australian government. The very small role that Australian aid plays in the Indonesian economy also suggests that Australia is not likely to influence policies by using aid as a threat. Tied humanitarian assistance is, of course, a very outdated approach to aid. Such assistance benefits those most affected by disasters—usually the poorest and most vulnerable. It makes no sense to make them suffer further, by attaching political strings. More fundamentally, Abbott’s comment misses the point. Indonesia should not end the use of the death penalty as a quid pro quo for development aid. The country should do so because it is an abhorrent practice which has no place in any justice system and is no longer accepted among the international community of states. It represents a sad, backward step for Indonesia’s justice system and its human-rights record.